Who invented the Motorcycle? The first motorcycle was a two-cylinder, steam-driven vehicle, powered by coal, called the “Roper Steam Velocipede“, that was invented in 1867 by the American inventor Sylvester Howard Roper. The invention of the first motorcycle was due to the mergence of a boiler, a steam engine, and a bicycle. The first gas-propelled internal combustion motorcycle, invented by Gottlieb Daimler (1834 - 1900), is often credited as being the first motorcycle but the Daimler motorcycle was not invented until 1885. Sylvester Howard Roper is not only famous as the American inventor of the Motorcycle but also as a businessman, engineer, designer and industrialist. 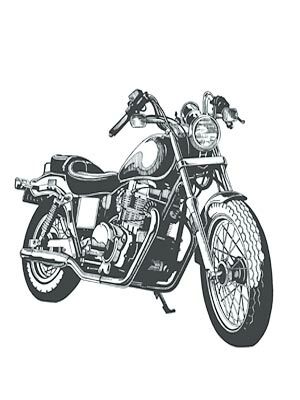 Definition of a Motorcycle: A Motorcycle is defined as a heavy, two-wheeled motor vehicle that is driven by a petrol engine, chiefly used by one rider but sometimes has two saddles to accommodate a passenger. Fact 1: Who invented the Motorcycle? The Motorcycle was invented by Sylvester Howard Roper in 1867 during the Second US Industrial Revolution era of inventions (1850 - 1914). Fact 2: Who invented the Motorcycle? Prior to the invention of the Motorcycle in 1867, different types of automobiles had been developed using steam and electric had been invented. Fact 2: What came first, the car or the Motorcycle? The Motorcycle was invented in 1867, nearly 20 years before the car. Nikolaus Otto invented the four-stroke Internal Combustion Engine and the Otto Cycle in 1876. The first true gasoline car was not invented until Karl Benz (1844 - 1929) invented such a vehicle in 1886. Fact 3: Who invented the Motorcycle? The inventor of the Motorcycle, Sylvester Howard Roper, was born on November 24, 1823 in in Sterling, Massachusetts and died on June 1, 1896. Fact 5: Who invented the Motorcycle? The early years of Sylvester Howard Roper were spent in Francestown, New Hampshire where he was raised by his family that included two more bothers and two sisters. His father, Merrick Roper, was a a skilled joiner and cabinetmaker and his mother's name was Susan Fairbanks. Fact 6: Who invented the Motorcycle? Sylvester Howard Roper received a good education at the local schools in Francestown. It was the exciting time of the Second US Industrial Revolution and Sylvester Howard Roper was fascinated by the new inventions, mechanics and new machinery. By the age of just 12 years old he had constructed a small stationary engine and two years later had built a locomotive engine. Fact 7: Who invented the Motorcycle? Following his education his first job was as a machinist. Sylvester Howard Roper worked in several towns. He married Almira D. Hill on April 20, 1845 in Providence, Rhode Island and the couple had a son who they named Charles Roper. The family finally settled in Boston, Massachusetts, in 1854. Fact 8: Who invented the Motorcycle? Sylvester Howard Roper became a prolific innovator producing products such as tools, guns, a handstitch sewing machine and furnaces. In 1861 the American Civil War erupted and Sylvester Howard Roper worked in Springfield Armory, in the city of Springfield, Massachusetts, the center for the manufacture of U.S. military firearms. Fact 9: Who invented the Motorcycle? In 1863 Sylvester Howard Roper invented a new type of hot air engine used to power small vehicles and went on to be the first man in the United States to build several successful self-propelled road vehicles. Fact 10: Who invented the Motorcycle? In 1865, after the Civil War was over, Sylvester Howard Roper caused a sensation driving his little Roper Steam Engine. People used horses to carry them about for personal use - not machines. Steam engines were used in power mills and factories, not for personal transportation. Fact 11: Who invented the Motorcycle? In 1867 Sylvester Howard Roper took the opportunity to invent a completely new, self-propelled road vehicle - a steam-powered velocipede - the first motor cycle. Fact 12: Who invented the Motorcycle? The invention of the Motorcycle emerged following the invention of the Velocipede, a forerunner of the modern bicycle. The Velocipede, meaning "fast foot", had a steer-able front wheel and was propelled by the feet of the rider with alternate thrusts of each foot on the ground. Fact 13: Who invented the Motorcycle? Sylvester Howard Roper developed his vehicle, similar to a Velocipede, that was propelled by steam and forged expressly for this purpose. The Roper steam velociped, the first motorcycle, had two 34 inch wooden spoke wheels with iron-band tires, footrests and a straight handlebar with wooden grips. Fact 14: Who invented the Motorcycle? The astonishing steam powered motorcyle had a vertical, fire-tube boiler, suspended between the wheels with a chimney. The lower half of the boiler served as the firebox which was fed with Charcoal through a small round door. Fact 15: Who invented the Motorcycle? The boiler was suspended from the middle of the vehicle's frame by a spring-loaded hanger to absorb some of the road shock) and was braced at the bottom of the steam boiler by two stay rods that were connected to the rear of the frame. A hand-operated water pump was mounted on the side of the boiler and oscillating steam cylinders next to the chimney. The water supply for the boiler was contained in tank that also served as the saddle. Fact 16: Who invented the Motorcycle? The piston rods worked on two cranks and a feed-water pump was operated by the left cylinder crank. The exhaust steam, which was transmitted by tubing into the base of the chimney, provided forced draft. Fact 17: Who invented the Motorcycle? The throttle on this early motorcycle, was located at the top the boiler worked by a forward twisting of the handlebar. A friction brake on the front wheel was applied when the handlebar was twisted toward the driver. Fact 18: Who invented the Motorcycle? By 1869 Sylvester Howard Roper was demonstrating his steam velocipede (motorcycle) at fairs, exhibitions and circuses. He made various improvements to his machine and the one gallon water reservoir and provided about 8 miles of travel on one filling. Fact 19: Who invented the Motorcycle? Sylvester Howard Roper, together with his son, Charles went on to build a successful business. Sylvester's flair for inventions continued throughout his life and he held patents for many invention including improvements to revolving Fire-Arms, shotguns and Knitting-Machines. Fact 20: Who invented the Motorcycle? Sylvester Howard Roper died of heart failure on June 1, 1896 in a crash in Boston whilst riding his steam velocipede, the first two-cylinder, steam-driven motorcycle. Fact 21: Who invented the Motorcycle? The German inventor, Gottlieb Daimler, produced the first first gas-propelled internal combustion motorcycle in 1885. His motorcycle was known as the "Daimler Reitwagen" (riding wagon). Fact 22: Who invented the Motorcycle? In 1894 Heinrich and Wilhelm Hidebrand were steam-engine engineers who teamed up with Alois Wolfmuller to produce the 'Hildebrand & Wolfmuller' which was the world's first production motorcycle. Fact 23: Who invented the Motorcycle? In 1895 American inventor E.J. Pennington demonstrated his version of motorcycle (Patent number: 574262) that had top speed of 58mph. It is E.J. Pennington who is credited with later having invented the word "motorcycle". Fact 24: Who invented the Motorcycle? In 1896 the Werner Brothers experimented with motorized bicycles in 1896 and produced the "Motocyclette" in 1897 with the engine mounted on the front steering head.